Preheat oven to 400° F. In a 9 x 13-inch casserole dish, mix together quinoa, turkey, black beans, enchilada sauce, tomatoes and taco sesasoning. Top with 3 cups shredded cheese. Bake for 20-35 minutes, or until cheese melts. 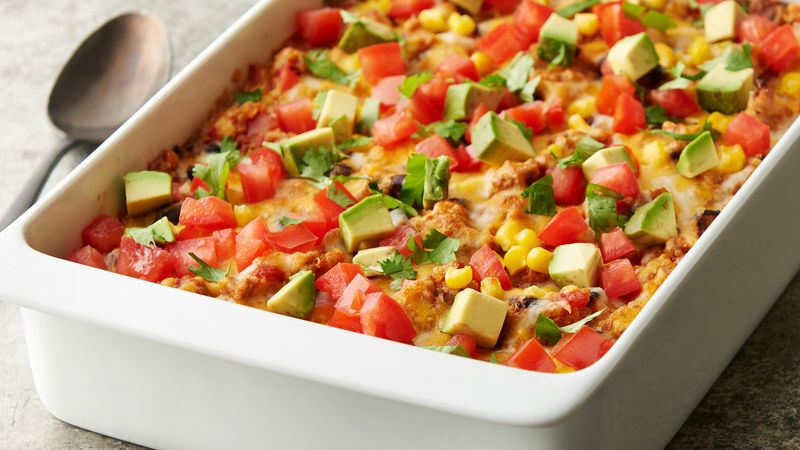 Remove from oven, stir casserole to mix, and top with remaining 1 cup of cheese, diced avocado, tomato, corn niblets and cilantro. Return to oven and bake for 7-10 minutes more, until cheese melts completely. Serve and enjoy!